After you save the changes, open /etc/hosts file and replace the current hostname with the new one near 127.0.1.1 IP address. The Point-to-Point Tunneling Protocol (PPTP) is a method for implementing virtual private networks. Since it is marked as non secure and vulnerable, I don’t recommend it as a “final” VPN solution. The main reason for its popularity is probably the native MS Windows support (since win 95). Also, it can be easily implemented with Mikrotik RouterOS (like I said, use it for internal VPNs only). To set up your CentOS box as a PPTP clients you’ll need the pptp package. Jul 20 10:58:50 mysrv pptp: anon log[ctrlp_disp:pptp_ctrl.c:773]: Client connection established. Jul 20 10:58:51 mysrv pptp: anon log[ctrlp_disp:pptp_ctrl.c:858]: Received Outgoing Call Reply. Jul 20 10:58:51 mysrv pptp: anon log[ctrlp_disp:pptp_ctrl.c:897]: Outgoing call established (call ID 0, peer's call ID 716). Jul 20 10:59:51 mysrv pptp: anon log[logecho:pptp_ctrl.c:677]: Echo Reply received. Jul 20 10:58:50 mysrv pppd: pppd 2.4.5 started by root, uid 0 Jul 20 10:58:50 mysrv pppd: Using interface ppp0 Jul 20 10:58:50 mysrv pppd: Connect: ppp0 <--> /dev/pts/1 Jul 20 10:58:50 mysrv pptp: anon log[main:pptp.c:314]: The synchronous pptp option is NOT activated Jul 20 10:58:50 mysrv pptp: anon log[ctrlp_rep:pptp_ctrl.c:251]: Sent control packet type is 1 'Start-Control-Connection-Request' Jul 20 10:58:50 mysrv pptp: anon log[ctrlp_disp:pptp_ctrl.c:739]: Received Start Control Connection Reply Jul 20 10:58:50 mysrv pptp: anon log[ctrlp_disp:pptp_ctrl.c:773]: Client connection established. Jul 20 10:58:51 mysrv pptp: anon log[ctrlp_rep:pptp_ctrl.c:251]: Sent control packet type is 7 'Outgoing-Call-Request' Jul 20 10:58:51 mysrv pptp: anon log[ctrlp_disp:pptp_ctrl.c:858]: Received Outgoing Call Reply. Jul 20 10:58:51 mysrv pptp: anon log[ctrlp_disp:pptp_ctrl.c:897]: Outgoing call established (call ID 0, peer's call ID 716). Jul 20 10:58:51 mysrv pppd: CHAP authentication succeeded Jul 20 10:58:51 mysrv pppd: MPPE 128-bit stateless compression enabled Jul 20 10:58:51 mysrv pppd: local IP address 10.16.18.252 Jul 20 10:58:51 mysrv pppd: remote IP address 10.16.18.251 Jul 20 10:59:51 mysrv pptp: anon log[logecho:pptp_ctrl.c:677]: Echo Reply received. To start this connection on boot, add “pppd call myVPN” in rc.local. Remember, x option means extract files with full paths. 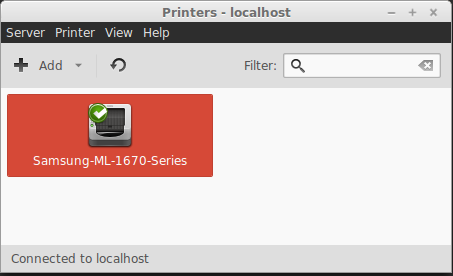 If you try to install Samsung printer (in my case ML1675) on Ubuntu 14.04 or Mint 17, you’ll may have some problems with missing file – rastertosplc. cd into /usr/lib/cups/filter and check the existence of rastertosplc file. The first file is probably created via install script while the second one is “fix” to “File “/usr/lib/cups/filter/rastertosplc” not available: No such file or directory” problem. After you did this, add printer via wizard and try to print test page. For example, the server IP is 10.0.0.1 and the client 10.0.0.2. I’d like to use /test and /var/test directories from the client system. To make them accessible we must “export” them on the server. From the client system, the NFS share is usually accessed as the user “nobody”. If the directory isn’t owned by nobody, the read/write access from NFS client should be made as root. In this howto, the /test dir will be used as root while the /var/test will be used as “nobody”. If /var/test directory doesn’t exist, create the dir and change the ownership to the user/group 65534 (nonexistant user/group). The no_root_squash parameter means access dir as root (all files copied/created from client will be owned by root). After you modify /etc/exports, run exportfs -a to make the changes effective.